We develop and deploy customized robust Quality Management System (QMS) adhering to any of the regulatory standards of your choice with minimal time and cost. There will be productivity increase and cost savings of more than 60% using our service. Your company will save money from several thousand to millions of dollars addinfaffg to your bottom line profit. 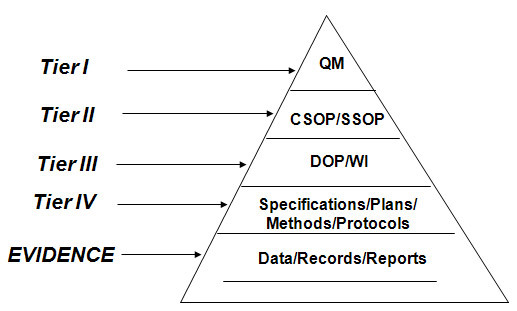 Implement QMS based on ISO 9001:2000, ISO 13485:2003, FDA Quality System Regulation Title 21 CFR Part 820, 210, 211 etc. The service also provides correlation between different standards, applicable clauses and gap analysis. 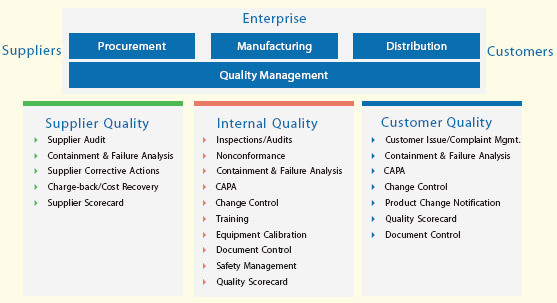 The quality management system service will establishes policies and requirements that apply to organizations employees, facilities, products and services involved in the design, manufacture, test, distribution, installation and servicing of products intended for use. The quality management system designed will ensure that products are safe and effective and to prevent nonconformance's at all product stages from design through servicing. Corporate Standard Operating Procedure (CSOP), Site Specific Procedures, Work Instructions, Forms etc. Methods for implementing actions necessary to achieve planned results and maintain the effectiveness of these processes. Quality Policy: Quality policy means the overall intentions and direction of an organization with respect to quality, as established by management with executive responsibility. Quality System: Quality system means the organizational structure, responsibilities, procedures, processes, and resources for implementing quality management. What is Title 21 CFR Part 820? In 1997, the FDA revised its current Good Manufacturing Practices (cGMP) to harmonize the requirements and terminology with the international standards (ISO 9001:1994 and ISO 13485:1996) and renamed it the Quality System Regulation. The QSR includes requirements related to the methods used in, and the facilities and controls used for, designing, manufacturing, packaging, labeling, storing, installing and servicing medical devices intended for human use. Will the FDA certify the Quality System for compliance to the 21CFR Part 820? The FDA does not certify a company's quality system. However, they do inspect companies that design and manufacture medical diagnostic devices. The inspection could include a review and evaluation of a company's quality system processes and procedures and quality system records related to the diagnostic products. If the FDA Inspectors observe any areas of non-compliance to the applicable regulations they will issue an FDA Form 483, which the company will be required to address. Title 21 CFR Parts 210 and 211 – Current Good Manufacturing Practice in Manufacturing, Processing, Packing, or Holding of Drugs.